Church Care (http://www.churchcare.co.uk ) have a project to repair or restore 100 Treasures across 12,500 listed churches in the nation. 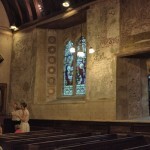 The wall paintings in Aldermaston Church have been designated one of those 100 Treasures. Funding has been provided by Church Care for the a conservation study of these paintings followed by any remedial work required. The study was initiated in 2015 and we met with Church Care today to discuss the report and the recommended next steps in getting the remedial work agreed and scheduled. As ever with ancient and listed buildings there is a lot of careful consideration and discussion on what should be done but we have planned the first phase of this remedial work for the late summer of 2016. Other remedial work is dependant on other activities within the main project and will be delayed. a) DAMP is a major issue in old churches like ours and is a major contributor to deterioration of wall-paintings. First we need to study the environmental and building factors that may be producing damp, then make the necessary remedial work to prevent damp before securing the wall paintings. Otherwise any remedial work on the paintings will inevitably be temporary if damp is still present. b) The cleaning of the wall-paintings will not take place until other works like new heating and lighting have been completed … we don’t want to clean them twice!